Heat oven to 375°F. Separate dough into 12 breadsticks. Cut each into 4 pieces; place on ungreased cookie sheet. Bake at 375°F. for 10 to 12 minutes or until lightly browned. Immediately remove from cookie sheet; place on wire racks. Cool 5 minutes or until slightly cooled. Split each in half, keeping tops and bottoms together to form miniature buns. Reduce oven temperature to 350°F. Beat egg in medium bowl. Add onion, milk, Worcestershire sauce, salt and pepper. Stir in bread crumbs. Add ground beef; mix well. Press ground beef mixture into thin layer in bottom of ungreased 13x9-inch pan. Bake at 350°F. for 14 to 16 minutes or until thoroughly cooked. Cut into 48 rectangles (8 strips crosswise and 6 strips lengthwise). 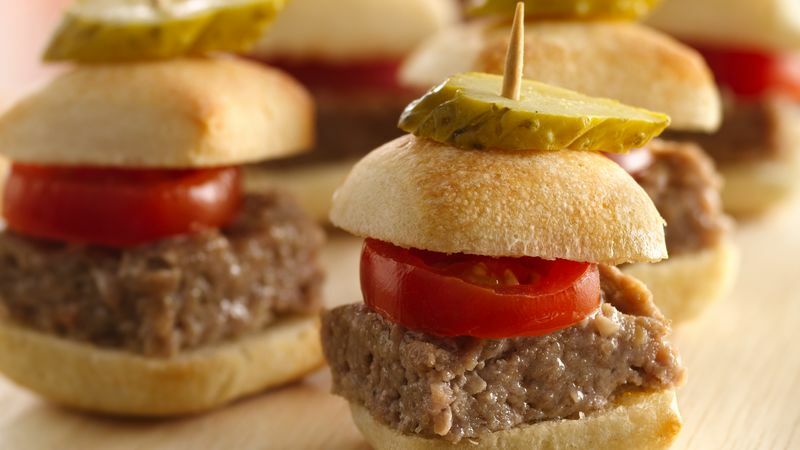 Fill buns with miniature burgers. Place ketchup in small bowl for dipping sauce. Serve immediately.